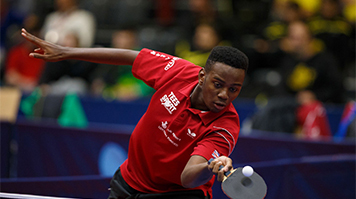 Ashley Facey-Thompson, who is studying Sports Coaching and Analysis BSc (Hons) at LSBU, has been selected to compete in the Table Tennis, Class 9 Individual and 9-10 team. This is a huge milestone for the 21-year-old, who made his international debut in 2009 and won his first National title in 2014. Ashley is one of the additional seven British athletes who will compete for ParalympicsGB at the Rio 2016 Paralympic Games, following late selections by the British Paralympic Association (BPA). After narrowly missing out on selection earlier this year, Ashley’s place in the team is a result of the decision by the International Paralympic Committee (IPC) to withdraw membership from the Russian NPC and reallocate places to other nations. “It was frustrating to miss out on qualification by one point and now to be in the team for Rio is amazing. It felt a bit surreal when I found out that I had been selected and it still doesn’t quite seem real. I’ve been training with the rest of the team throughout the summer so I feel prepared but now I’ve been selected and I’m in the team I feel really happy,” said Ashley. The Paralympics will begin on Wednesday 7 September in Rio. Ashley will strive for medal success competing in both the individuals and teams tournaments with his teammate Kim Daybell. Keep track of the Rio 2016 Paralympics and learn more about the Academy of Sport at LSBU.